To set out on a journey like this – 67 kilometres – just over forty miles, or a marathon and a half – of walking, camping, praying, etc. – you may need some good reasons. A strong sense of adventure isn’t enough to make everyone fill out the registration form. So, for those of you asking, “Is this pilgrimage really for me?”, you will, hopefully, find your answer here. Who? Wittingly or unwittingly we are all pilgrims. We each have a spiritual destination to which we are headed. For those who embrace the pilgrimage, the road on which we walk is difficult, but God offers all that is necessary to reach the destination. For those who have not set their sites on a destination, the road is wide and easily travelled, but the destination is undesirable. If you want to take the narrow path that leads to heaven, then the disciplines of the pilgrimage are for you. Everyone who wants to go to heaven must choose to walk the road that leads to heaven. One need not to walk the Opeongo Line in order to reach heaven. This pilgrimage is, rather, a microcosm or symbol of the real pilgrimage that leads to our heavenly homeland. 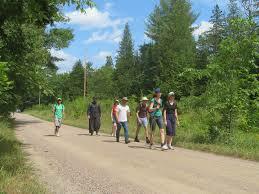 The Opeongo pilgrimage is for those who are physically able and have a desire for spiritual growth. You do not need to be a great athlete or even a mediocre athlete; you just need to be willing and able to persevere through that 67 kilometres of walking over 3 days, which includes fatigue, heat, camping, rain, bugs, and whatever else may come your way. A 6-year-old and a 78-year-old have both completed the entirety of the walk, but that doesn’t mean it’s easy. There have also been teenagers and young adults who quit after a day because of their lack of physical – and psychological – preparedness. Know yourself. Prepare yourself. What? As alluded to in the previous section, a pilgrimage is a spiritual journey. In his essay, The Idea of a Pilgrimage, Hillaire Belloc describes pilgrimage in this way, A pilgrimage is, of course, an expedition to some venerated place to which a vivid memory of sacred things experienced, or a long and wonderful history of human experience in divine matters, or a personal attraction affecting the soul impels one. This is, I say, its essence. This idea of a pilgrimage leaves the door open to variations. The cloistered nun meditating intently on images of Calvary places herself at the feet of Jesus, next to Mary, and so, despite what one might assume, she is able to journey thousands of kilometers without leaving her cell and make her pilgrimage to the Holy Land. Whether the journey is on foot or bicycle, by car or bus, or even just in one’s imagination, it can participate in what it means to be a pilgrimage. We must simply set out on the road to which God calls us. Walk the Opeongo Line is an ascetical type of pilgrimage. It is not the most ascetical type, but it does impose various challenges. Our pilgrims are not obliged to go barefoot garbed in sackcloth and ashes or to climb the steps of the churches on their knees, though, they could if they want to. The distance, weather, bugs, perhaps other pilgrims, and various other things are all crosses that we willingly take up as we walk to St. Ann’s. Perhaps, for some, the prayer disciplines will be challenging: attending a Latin Mass, singing or reciting the Rosary, adoration, confession, and attending daily Mass are all moments in which we encounter God’s greatness and our own weakness. There are many moments during this pilgrimage in which we will recognize our weaknesses, and in those moments we should remember the words of St. Paul, For the sake of Christ, then, I am content with weaknesses, insults, hardships, persecutions, and calamities; for when I am weak, then I am strong (2 Cor 12:10). Why? This is the most important of the questions. St. Thomas Aquinas, speaking about man’s last end, says, Although the end be last in the order of execution, yet it is first in the order of the agent’s intention (I-II, Q. 1, a. 1). Unless we have a reason to set out on the pilgrimage, we won’t even begin. It’s easy to stay home, to make excuses, and to be busy with the things of the world. However, if we want to take ‘the road less travelled’ and the ‘narrow path’, we must be willing to set aside time and energy for the things of the Lord. An ascetical pilgrimage is a traditional and proven way to allow God to show you the path to heaven. In the great pilgrimage that is the Christian life, the end is to know, love, and serve God in this world and to be happy with Him forever in heaven (cf. Baltimore Catechism, 1). God, through Christ and His Church, has given us everything necessary to achieve that end. This little pilgrimage is a concentrated dose of Christ and His Church. Over the course of four days we experience highs and lows of the spiritual life. We encounter Christ in the Sacraments, in Scripture, in our neighbour, in nature, and in ourselves. At times we want to quit. At other times we wish the pilgrimage would go on for a few more days. But, most importantly, when we walk the final meters up to the shrine in the hot end-of-July sun, and we hear the heavenly bells of St. Ann ringing, we know that we are home.